La Pergoletta offers one of a kind, delicious Italian cuisine at a bargain price. Fresh ingredients prepared by the most capable hands await you, your friends and your family. Stop by for lunch or dinner. Begin with appetizers like the antipasto misto or have a fresh salad like the panzanella or the burrata salad. La Pergoletta also features a variety of pastas like the lasagna bolognese or the burro and salvia filled pasta, if you're looking for a richer and heartier dish. Other popular choices include the tagliata classica chiecken and the tagliata creme di funghi filet minion with porcini, portobello and Parisian mushrooms and creme. Finish off the experience with affogato al caff, a scoop of vanilla “drowned” in Lavazza espresso. Go all out with the panna cotta caramello or the cannoli. La Pergoletta would like to personally invite you out for an elevated experience. The place has an old school Italian ambiance and an extensive menu. My seafood risotto was totally unacceptable- a wet, tomato based stew, more than a risotto. I had to send it back, and I have not sent back a meal in over ten years. My date’s pasta was better, but nothing great. We will not be returning. They were very accommodating in terms of getting us in, but requested that we be done by a certain time. We said no problem. Turns out as soon as we got our orders taken, the food came out like 5mins. literally. I wasn’t sure if we were going to like our dishes but we were pleasantly surprised. Great food, fast service, great staff...can’t complain. My wife and I had a fantastic dinner for her birthday. The food was beyond delicious and indeed very "authentic" as many of the other reviews stated. The ambiance was cozy and very romantic, it was actually bigger than some of the pictures make it out to seem. As far as the service, unlike a lot of the other reviews we had excellent service. Our waitress was prompt, friendly, knowledgeable and attentive. We will most DEFINITELY be back! Amazing food, nice atmosphere, overall wonderful experience. Second time here and we fell in love even more! Their pasta is to die for! Solid, quaint neighborhood restaurant. A lot of old Italian style (Southern) with a little dab of newer (Northern) Italian flavors. What a joy it was to dine at La Pergoletta! A hidden gem in a strip mall in Los Feliz. Drippy candles, a gorgeous Montepulciano d'Abruzzo wine served in tiny water glasses, rubber samples of the desserts. It was... a true fantasia on national and irrational themes. Felt so at home here. Suburban and a fairy tale. Would recommend to any friend looking for a v special place to dine! The food is quite good and traditional. I wish I could say the same for the service. A busboy visited our table a few times but as soon as he asked if everything was ok and we answered, he said he couldn’t speak English? Why ask then? Another busser (this one a girl) came to our table a few times but when we asked for a refill of bread and water she walked away never to return. The waiter looked disinterested and bored at best. Maybe he was having an off night? When we asked him a few questions about the menu and certain dishes he almost sounded annoyed in his response. I would love to come back and try the food again, hopefully with a better service experience. La Pergoletta has consistently been my favorite Italian restaurant on the east side. The food is freshly and expertly prepared. The service is friendly and attentive. The ambiance has no pretentiousness, but is warm and inviting. 5 stars! The food was delicious, but we waited over an hour to receive our food. We checked in twice and they simply said the kitchen was backed up. THe food is great but unfortunately not worth the visit with such slow service. I LOVE this restaurant - everything I have had there is delicious and simple. The food is so authentic and beautifully prepared - I would go every week if I lived closer! The people were awfully nice here and the food was OK. OK for a neighborhood Place. Service could be quicker by employing more staff. Everyone is friendly, though. Amazing pasta and atmosphere. This review has to be so many characters long. Great service with very delicious affordable food, would come again! 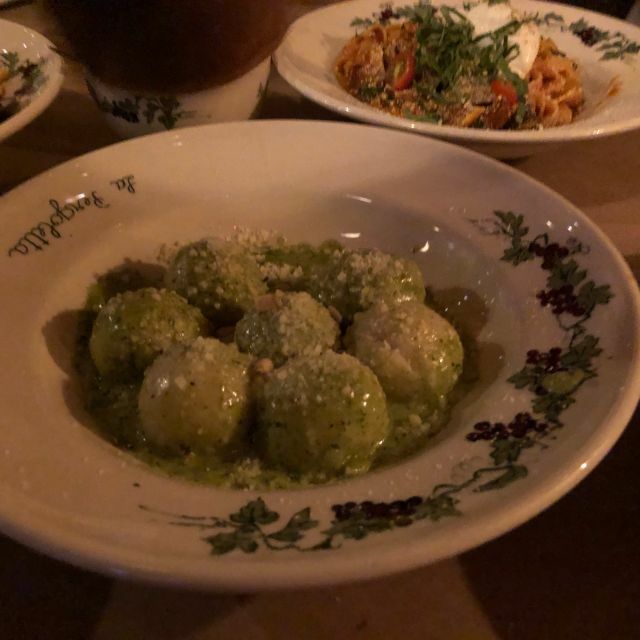 Get the cream pesto gnocchi! Delicious, authentic. Only knock is on the Caesar salad- drenched in dressing. The spaghetti noodles were a little more al dente than we would have liked but everything tasted wonderful. The focaccia was perfect. We would have loved if the entire bread basket had been focaccia. Service was somewhat slow but very professional. Overall we had a wonderful experience! I predict the angel hair pasta may be closer to what we'd prefer so no hard feelings regarding the spaghetti. I love that the noodles are hand made in house! Just awesome. Server was great but it was a bit slow because she had the whole back room and it was full. Food was delicious. Oreo dessert was amazing! Amazing food , amazing atmosphere, and amazing authentic italian food!! Food was excellent! They were served in temperature that assures you that they are being served “a la minute”! We came early for our reservation and they accommodated us. Only complaint is they don’t follow serving system where waiter tells whoever is serving food which diner gets what entree. It is really annoying when they ask who gets what when they are serving the food. There was only 4 of us! Ambience is nice and dimmly lit by candle light. Food is amazing, fresh and taste delicious. We had a wonderful meal and will definitely be back. We want to try the new location in Silver Lake too! The pastas were very delicious, but they need to add some more vegetable appetizers and sides to the menu. Amazing food, it’s one of my favorites. Incredible/Fresh food, great service, and amazing ambiance! They cancel reservations after 10 minutes without warning or notice when booking the reservation. Also, our dinner was interrupted by firefighters trying to get through when another guest in the restaurant was carried out in a gurney. It was an awlful experience. Great food. Great ambiance. Great wait staff. I had thought I made the reservation for 6:15, but in reality made if for 5:15. Upon arrival, the hostess was not very helpful. After I gave her our names she said the reservation was missed and she didn't offer to seat us. I asked her if she could seat us and she said she didn't think so but could possibly put us outside. (by the way, the entire restaurant was virtually empty) She did end up seating us inside but wasn't very nice about it. I took a photo to show how empty it was at that time. I won't hold her unpleasantness against the entire experience and would recommend this place to friends and family. La Pergoletta is one of my favorite restaurants in LA. The food is always delicious and for that alone, I will keep coming back forever. The food was fantastic, the service was great. Really nice place and a good discovery! Pasta were really good as in Europe! It was a pleasure for us to have a real taste of Italy! Have loved this neighborhood restaurant in the past even though the service is questionable. This particular visit was particularly bad! The hostess was cold and borderline rude, service poor and though it was busy and people were waiting, two tables next to us were told they needed to leave because they needed to seat other people...we were shocked. The couple at the table next to us were only there about an hour and the table next to them was asked to leave as well. They were so angry understandably! Lucky they didn’t ask us to leave as to leave as I would have left and not paid the bill. It’s a shame because this policy is not to be tolerated when you’re out on a Saturday night and trying to enjoy a meal...I may never return, as this has left a bad taste in my mouth, so to speak. Love this place! But on my recent visit, while finishing our bottle of wine, the hostess came up and told us we had to leave as our table had been reserved. This has happened to me at other restaurants and I'm not shocked that a popular place has to turn its tables over. But the way she told us was rude and hostile, and totally abrupt -- give us a 10-minute heads up and we'll sip our wine faster! This experience left a really bad taste in my mouth. There's a nice way to ask people to make way for the next customers, maybe La Pergoletta could find it. One of the best hidden gems in the area. Affordable and absolutely delicious. Food was beyond amazing but service was really slow! I felt like I was back in Italy. Truly authentic!